As I sit here at our kitchen table, I struggle a little bit for words to describe what the last month has been like. 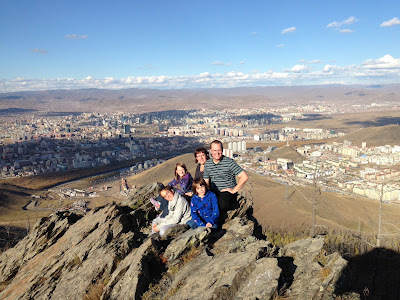 It's been just over one month since we landed here in Mongolia and were thrown into a whirlwind of activity. 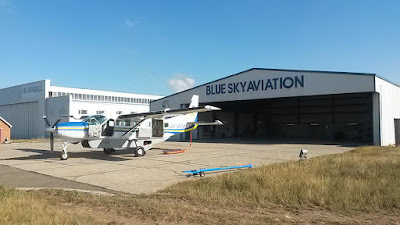 Our plane landed slightly later than scheduled, just before midnight local time, but we were still greeted by many of the Bluesky Aviation staff who had waited patiently for our arrival. One big question for us was if all (or any) of our bags would all show up in Ulaanbaatar (UB) with us. We had checked our bags back in Grande Prairie when we first boarded Westjet the day before. We had flown from GP to Calgary, then to Vancouver and Seoul, and our final flight was to UB. Two of those flights had quite short layovers, and there was no way for us to know if our bags had all made the transitions that we had made on the way. We were very glad and thankful to see every one of our bags come through on the baggage conveyor as we waited after our flights! 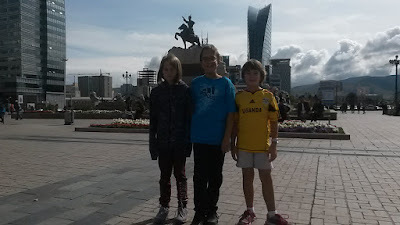 We were then taken to our apartment, which is located in downtown UB, only about an 8 minute walk from the office. I had about a day and a half to try and get my head on straight (the time difference was 15 hours, now 14) and I was right into all of the things that needed to be done to get me flying. One air law test, taking countless online courses, tracking down certificates, license validation and many more things flew past in a bit of a haze that first week as we jammed as much into it as we could. The reason that there was no time taken to adjust to time zones or the new culture was that Ryan, the pilot who has been here for the past 7 years, is leaving this coming Friday (two days from now) and there was simply not enough time that we could afford to wait at all to get going on most of these things. To be honest, I don't really remember most of it as it passed by in a bit of a jet-lagged haze, but there WAS a lot of stuff accomplished that first week, I do know that. As soon as my license was validated I was scheduled for flying. I had two days of flying with our training officer, who does not live here in UB but who had flown in to conduct my training. He was scheduled to fly out in a few days, and so the tight time table continued to press us forward. The training flights went well, even though many of my flows and muscle memory needed sharpening up after a couple of months without much flying. Flying here in Mongolia is different than anywhere else I have ever flown. Air traffic control is done here in Mongolian (the international standard is English) and so they require that a Mongolian speaking radio operator ride along as a crew member. It is interesting to hear radio calls come through and then have to wait for the translation, although I am beginning to get used to the way things are done here and can already begin to anticipate what the clearance will be. Another challenge is that here the altitudes are given in meters above sea level. Once again, this is very different than the international standard of feet above sea level. Non of the altitude equipment in the airplane show meters, so all clearances need to be "translated" into feet, and of course the altitude is always an odd number of feet. Again, it's something that I'm beginning to get used to, and I have to look at my altitude conversion table less and less as I begin to remember what the appropriate altitude in feet is when given an altitude in meters. Taking frost covers off of the wings in the morning after an overnight stop in the countryside. The Mongolian countryside is spectacular. I had no idea that there were so many mountains here, or that the elevation was so high. We are even higher here than we were in Uganda. UB is at 4,350 feet above sea level. The highest airstrip that I've landed on so far is at 7,300 feet elevation. That runway has a nice uphill slope to it as well. The nice thing about flying here right now is that it is getting cold. Most days are down around the freezing level, and the cold had a positive impact on the performance of the airplane. Another interesting thing about flying here is the weather. There is almost constant wind here. In that, it does feel a little like flying back in Alberta. Controllers give the wind in meters per second, another interesting deviation from international standard. One nice thing about it is that the numbers seem smaller. "Wind is 260 at 13 meters per second" sounds a lot more manageable and less intimidating than the equivalent "Wind is 260 at 26 knots." My crosswind landing skills have been polished off and it is already beginning to feel a little weird when landing with no wind. Mongolia is a big country. In Uganda, the furthest that we could fly in a straight line and still be in the country was about 1 hour and 45 minutes. Here, the furthest flight that I've done so far is 5 1/2 hours, and that was straight line, before I picked up passengers and headed back. It's on those flights that one realizes how important it is to manage liquid intake, as well as how large ones bladder can get. No troubles or humorous anecdotes on that front yet. Many of our flights are medical flights. The medical care that is available in the countryside is often not that great. It is... "adequate" in a few places, but even there the care provided often is only enough to get the patient well enough to travel to UB for further treatment. Our medical flights can make a huge difference to the well being of the patients that we fly. Last week I flew a medical flight that included two infants. The "big" baby that we flew weighed 1 1/2 pounds, and did indeed look large when observed next to the second infant that rode on that flight. Teeny-tiny babies who were being taken into UB to get the help that just wasn't available to them in their own town. I flew another team out west to a small community where they conducted an assessment clinic. A few days later returned to pick them up, along with two families with children who were being transported to UB to undergo two weeks of physiotherapy to begin the process of straightening crooked joints, teaching them to walk properly (or crawl properly), and training the parents proper techniques to continue rehabilitation once they return to their town. Next week I will hopefully fly those families back to their homes where their children will hopefully be able to continue improving and enjoy a higher quality of life. Well, that's just a short glimpse of what the last month has held for me. Now that winter is near the flying will slow down considerably and we will begin to take Mongolian language lessons. I enjoy the sound of the Mongolian language, and there will be some interesting challenges to meet for all of us as we start to navigate the varying challenges and frustrations of learning a new language. Karen and the kids are also settling into their lives here in Mongolia. It is very different than what our lives were like in Kampala, but so far the transition has gone well. If you are interested, Karen's blog talks a little bit more about some of the things that she and the kids have gone through during this transition. Thank you for your prayers and support for us as we have undertaken this huge transition from Uganda to Mongolia. Keeping an open heart and following God's leading in our lives has indeed been an adventure, and has brought us somewhere we would never have dreamed that we would ever be. It will be interesting to see what lays ahead!